I liked what I heard about Nimona by Noelle Stevenson when it was published in 2015. I finally got hold of a copy a couple of weeks ago, and this National Book Award Finalist did not disappoint. 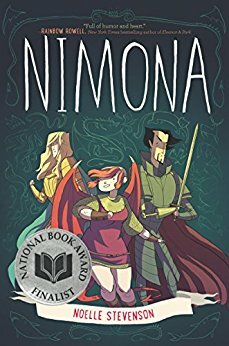 Nimona is a graphic novel about a joyful young female shape shifter who is game for, and good at, any kind of violence. She throws her lot in with a supervillain, one with a backstory that involves injury and disappointment. Morally, he's a little horrified by Nimona, though he definitely becomes attached to her. There's what was for me a surprising and subtle love interest. I'm not going to say much about it and ruin anyone else's reading experience. The world these people live in is an interesting one. It's your traditional high fantasy setting with knights and medieval-looking people, but one to which science and modernish weapons have been added. Great-looking art. Also, this is my favorite kind of graphic novel, one in which the story is showed totally through the images and dialogue, no narrative boxes telling us things. Lots to enjoy here and not much to complain about.